Welcome back for more Love from the Grill! Today on the grill: corn on the cob. Variety: White (smaller, sweeter) and yellow (bigger, more flavor) kerneled corn are the most popular eating varieties today. Choose a hybrid -- with yellow and white kernels -- for best-of-both-worlds flavor. Peak Corn Season: May through September. Look For: Ears that are bright green with tight-fitting husks and golden-brown silks. Store: Corn is best cooked the day it's purchased. Otherwise, keep in the refrigerator up to one day. 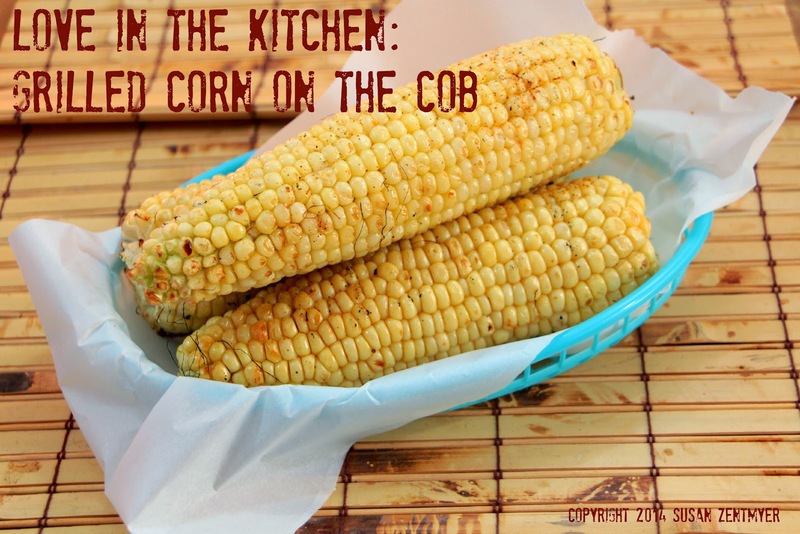 Now that you have some great corn, you want to make sure you cook it properly. 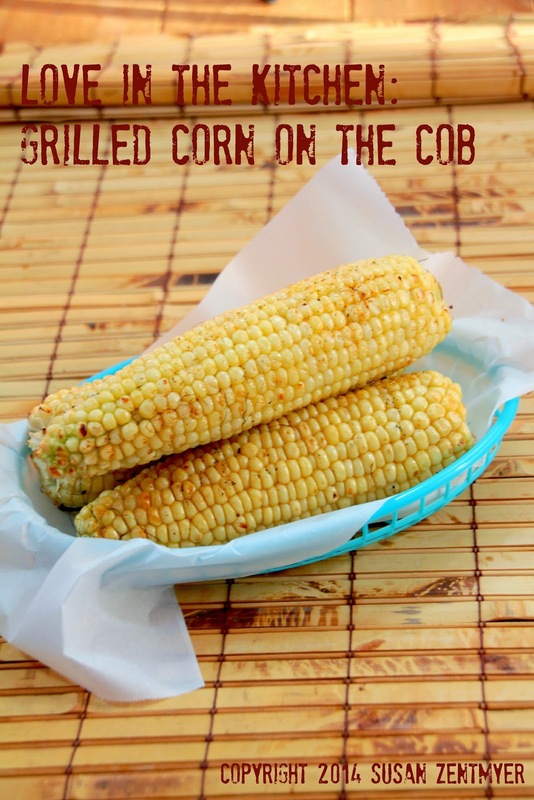 Grilling is an incredibly easy way to cook corn. There are lots of recipes for grilling corn on the cob. 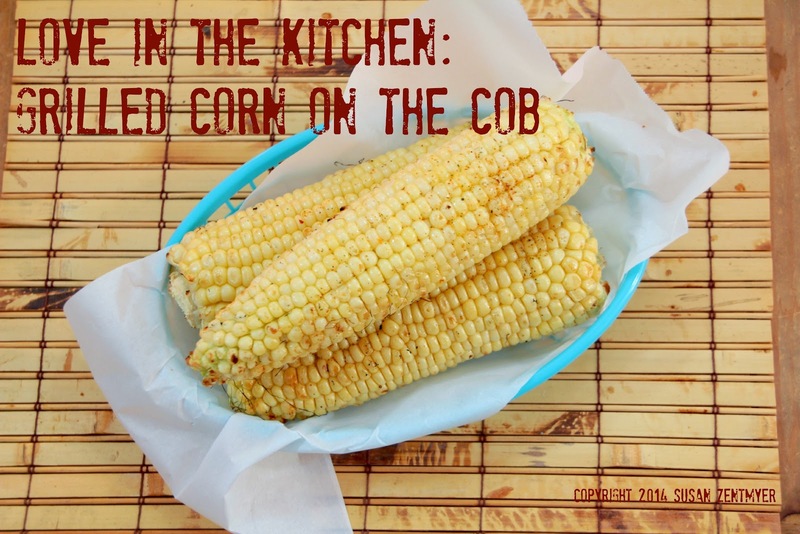 Many recipes call for you to leave the corn in the husk or to seal the corn in aluminum foil. I like to put it right on the grill... otherwise you are just steaming the corn. Preheat the grill to medium high. Remove the husks, pull off the silky threads that get stuck in your teeth. Wash the ear in cold water. Put the corn on the grill about 20 minutes before everything else is ready. I like to use the uppper shelf on my grill so that the heat is less direct. If you don't have a second shelf, put the corn around the edges of the grill. Rest the ears between the bars of the grates so you can easily roll them from groove to groove. Leave 2-4 grooves between ears for easy rolling. Brush the corn all over with melted butter. Try not to let too much of the butter drip onto the fire - it will flare up and get the corn sooty. If there is a flareup, move the corn to another part of the grill. Close the lid and grill over direct heat for about 4-5 minutes until some of the kernels get toasty golden. Roll the ears a couple of grooves, about 1/4 turn, and paint them again. Keep browning, turning, and painting until you have done all four quarters. Remove and serve. You'll love this sweet and buttery corn, and I bet this will become your favorite cooking method too!